3.6. 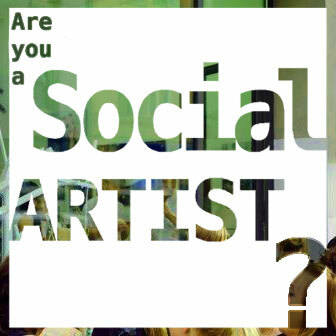 By submitting to the Award the applicant agrees and acknowledges that the Social Art Award and the Institute for Social Art and Innovation is permitted to receive the applicant’s registration data. 3.7. 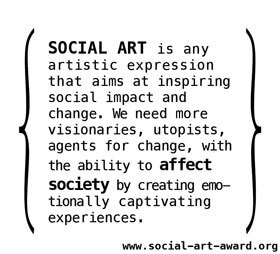 By submitting to the Award the applicant agrees that the Social Art Award and the Institute for Social Art and Innovation, may reproduce their work (at no fee) for communication purposes (including press, publicity, website, social media, promotion, catalog, books and any other printed or digital material in relation to the Social Art Award and the Institute for Social Art and Innovation), excluding for resale. 3.8. By submitting to the Award the applicant agrees to be placed on the mailing lists for newsletters or announcements of future calls and projects by the Institute for Social Art and Innovation. 4.1. A registration fee has to be paid to enter the award. The fee covers parts of the award's organizational expenses. The reduced registration fee is 25.00 EUR for each work. If you submit two works it is 50.00 EUR etc. Elligible for reduced fees are applicants under 25. Citizens of eligible countries (please check list of UN) pay 0 EUR - they participate free of charge! 8.1. The decisions of the awarding jury are unrecallable and undeniable. Each applicant gives to The Institute for Social Art and Innovation, without any compensation, the rights of reproduction, exhibition, publication, translation and communication to the public, in any manner and without exception, for their works and for the texts submitted for the selection.